Sylvia’s Upcoming Events: a Writers Retreat and a Readers Convention. Will you be there? Sylvia is looking forward to presenting one of the keynotes at the Washington Romance Writers annual writers retreat: In Company of Writers in Westminster, MD, April 21-23. Follow @SylDay on twitter for peeks into this exclusive event. The weekend starts out with an open-to-the-public booksigning on Friday April 21. Come on out! Two weeks later, May 2-6, Sylvia will be mixing with thousands of readers in Atlanta at the annual RT Booklovers Convention and is especially looking forward to the Giant Bookfair on Saturday, May 5. You don’t have to be registered for the full convention to go to the Bookfair, but if you are, check out what Sylvia has for you! 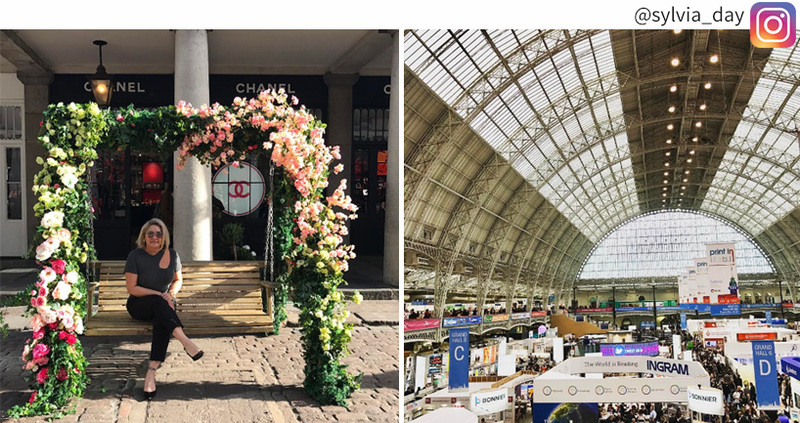 Recently, Sylvia was in England for the London Bookfair and had a fantastic time, posting lots of snapshots of her trip to instagram. Are you following @sylvia_day? Why can’t I find MY SYLVIA DAY on the app store?